The PROTECT OUR COAST AND OCEANS FUND is listed in the Voluntary Contributions section of the California state income tax return. Taxpayers can simply fill in a tax deductible donation amount in the box next to this fund, which is Code 424. You can donate any amount in whole dollars. Where is the "Voluntary Contributions" section? Near the end of the form, just before you total the amount you owe or will receive as a refund. On California Tax Form 540, you'll find the Voluntary Contributions on Side 4. On Forms 540 2EZ, 540 NR-Long, and 540 NR-Short, they are on Side 3. If you use Turbo Tax, there is a page that asks "Donate to a California Special Fund?" Click "Yes" and a page with the list of funds will come up. Scroll down until you see the PROTECT OUR COAST AND OCEANS FUND. If you use H&R Block software, under the "State" tab there is a "Miscellaneous" heading where you can go to "Contributions." Scroll down until you see the PROTECT OUR COAST AND OCEANS FUND. What if I use an accountant? 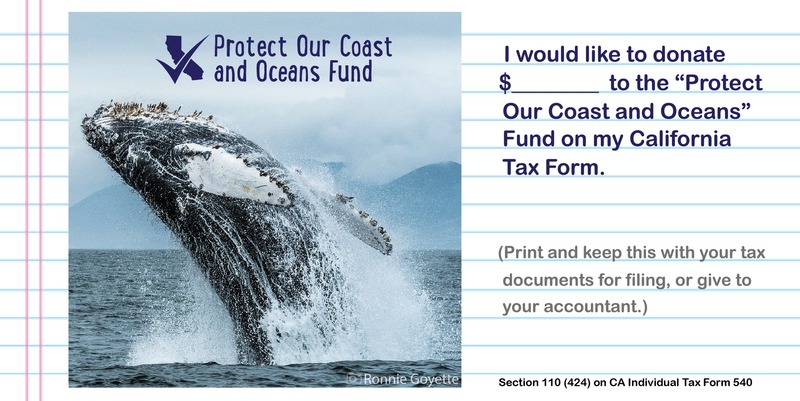 Notify your tax preparer that you would like to make a donation to the PROTECT OUR COAST AND OCEANS FUND! Yes, your donation will be deductible on your 2019 federal tax return (if you itemize deductions). Contributions to this fund will be dispersed back into our communities as part of the Coastal Commission's Whale Tail Grants program, which funds K-12 education, public awareness campaigns, citizen science, and coastal stewardship efforts throughout the state. Learn more about the Protect Our Coast and Oceans Fund.